Jonathan Santiago Rosario from Colorado is suing coffeehouse giant Starbucks for violating provisions of the Fair Report Credit Act (FCRA). Rosario applied at Starbucks in March of 2016 and after interviewing, a background check was conducted by Accurate Background Inc. The check returned with violent crimes and drug charges out of Pennsylvania. Here’s where it gets a little fuzzy; the report stated that Accurate Background Inc. determined that Rosario did not meet the hiring criteria of Starbucks. Why a Credit Reporting Agency is performing individual assessments I don’t know? It should be the hiring company’s responsibility to perform the individual assessment. Starbucks sent Rosario a letter April 20th and stated that he did not meet the job requirements with the criminal background. Rosario claims that Starbucks had removed him from consideration upon the receipt of the letter. Mr. Rosario also stated that he had never been in Pennsylvania and he had no criminal record. Rosario said that this information was inaccurate and he was a victim of identity theft. Rosario contacted Accurate Background Inc., exercised his rights and filed a dispute. By May 19th Accurate Background Inc. had investigated the dispute and corrected the information on Rosario and sent the corrected report with Rosario’s new background check to Starbucks. Having corrected the issue in less than a month, Rosario attempted to contact Starbucks to revive his employment application and was denied. Rosario stated that Starbucks did not provide reasonable time to correct the false information. When dealing with adverse information returned on a background check, “walk don’t run” is the best approach. If the adverse information violates your company’s individual assessment and you are not moving forward with the applicant a pre-adverse letter should be sent to the applicant (this is automatically completed on our screening site and ready for you to email with all adverse findings) informing them of the who, what and where of the information found. If this information is false as in the case of Mr. Rosario the applicant has the right to dispute it and have it corrected. The FCRA does not state a specific time frame a company should wait between pre-adverse notification and adverse notification. It states “reasonable amount of time”, which has been taken to mean at least five (5) business days. If no communication has been received from the applicant to you or your CRA after that time, then an adverse notification letter can be sent to the applicant (also automatically completed on our screening site and ready to email). 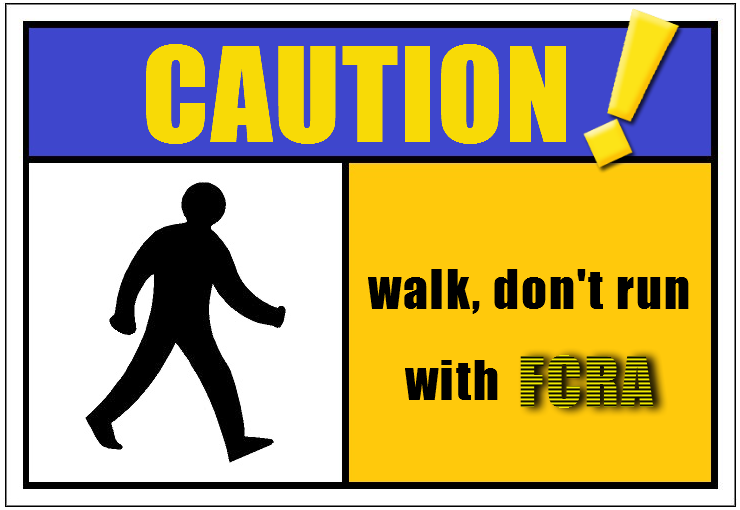 So, remember, “walk don’t run” when it comes to FCRA compliance.